Mora Romagnola Pigs are from Emilia-Romagna, in northern Italy. In the early 20th century there were several similar but distinct regional sub-types of Romagnolo pigs, including the Forlivese from the area o Forli, the Faentina from the area of Faenza and the Riminese or Mora Riminese from the area of Rimini. From the beginning of the century all of these types began to be crossed with British Yorkshire pigs, which were first imported to the area in 1886. First-generation crosses preserved the some of the meat quality of the local breeds, but grew much faster. 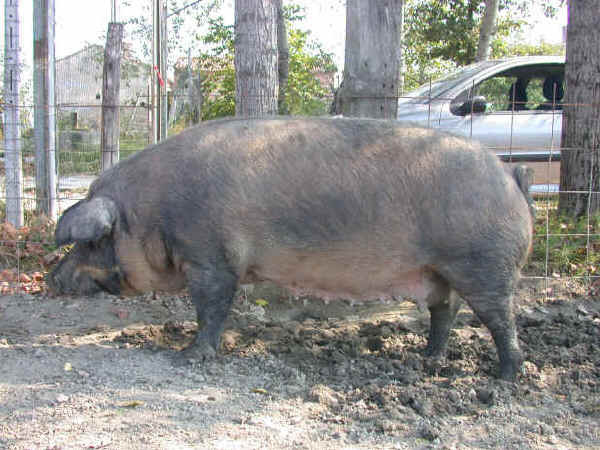 By 1927 they was recognized that indiscriminate cross-breeding beyond the first generation lead to the disappearance of the local stock, and in 1941 selective breeding of Romagnolo pigs began; in 1942 the breed was named Mora Romagnola. In 1918 there were 335,000 Romagnolo pigs in Italy. The population declined rapidly both before and after the Second World War, falling to 22,000 in 1950 and to a low of 12, all in one farm, in the early 1990s. At that point the Italian World Wildlife Fund, the Università degli Studi di Torino, and other institutions launched a recovery project, and numbers have since increased. A herdbook was established in 2001 and is kept by the Associazione Nazionale Allevatori Suini, the Italian national association of pig breeders. The conservation status of the Mora Romagnola was listed as critical by the FAO in 2007.At the end of 2012 a population of 1063 was reported. The breed remains at risk from crossing with Italian Duroc pigs; first-generation hybrids are difficult to distinguish from pure-bred stock.